Wennington Green, an anonymous stretch of grass in Bow, East London, is symptomatic of the not-entirely successful attempts to prettify the area over the last two decades. It cowers between a belching right-angled traffic junction and the Regent’s Canal, and can claim as assets little more than a dozen trees and what seems like half that number of dog-walkers. It is remarkable, in fact, only for what is not there. There is no commemoration, no indication whatsoever that from 25 October 1993 to 11 January 1994, it played host to its very own culture war. To say the early 1990s were a time of upheaval for the then-predominantly working class neighbourhoods of the East End doesn’t come close; the Conservative government had put an enormous amount of faith into constructing a new financial centre around Canary Wharf, a few miles south of Wennington Green. In the surrounding areas, ‘regeneration’ became a mantra. The terraces around the Green, heavily bombed during the Second World War, were among the first places marked for demolition: ‘Thatcher wanted to create a “green corridor” around Canary Wharf’, Rachel Whiteread says, ‘I had my studio nearby and used to cycle past. I was very conscious of the fact it was all about to change’. Meanwhile at Wennington Green, large-scale demolition had left only one house standing. Its occupier, Sydney Gale, was determined to hold out against the local Liberal Democrat council, but it was only a matter of time before it too was flattened. 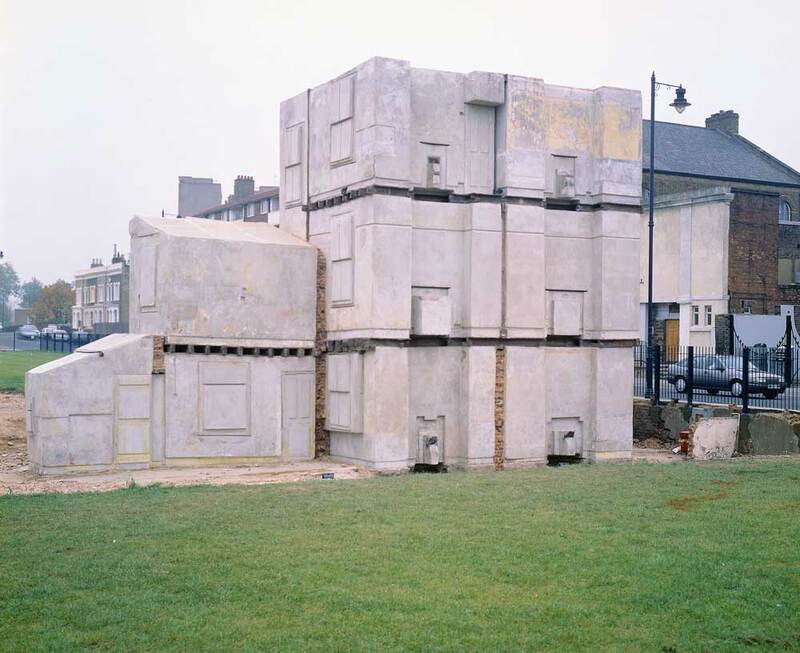 Having trawled northeast London for a condemned house with three sides intact, Whiteread and Artangel had found an eerily ideal location for their project. When finally Gale agreed to rehousing, the labyrinthine negotiations began with what Lingwood refers to as the ‘local players’ of East London politics. However hard the story of the ‘communications revolution’ is rammed down our throats, it’s still surprising to discover that Whiteread, who was living in Berlin at the time, was kept abreast of the arduous protocol via scheduled conversations on the unreliable pay phone at the end of her street. When they were at last accorded temporary planning permission, Whiteread and her team faced the daunting challenge of actually creating House. The meticulous process involved pumping 193 Grove Road full of liquid concrete and stripping off the exterior – that is, the house itself – so that only the impression of its innards remained. They had only one chance to get it right, and as Whiteread bluntly summarises, ‘if the cast had split, it would have been a disaster’. ‘We had extremely good advice about the planning and execution,’ Lingwood adds, ‘but there was no plan b’. Fortunately, the risk paid off, and House was unveiled on 25 October 1993. It was an extraordinary work of art by any standard, an impenetrable inversion of domesticity – a machine for not living, if you like. It was obvious that it would not be ignored, but nobody could have predicted the publicity cyclone that followed. In spite of the inexplicable bile it attracted from some corners, James Lingwood remembers ‘an extraordinary group of advocates… we had ‘pilgrims’ coming from all over the world’. As for the sentiment amongst the people of Bow, Lingwood is careful not to generalise: ‘there’s a lot implied and a great deal of potential misunderstanding about the phrase “local people”,’ he says, ‘in fact, the local reaction was the same as anywhere else – extremely positive, but also hostile’. It seems improbable now that a work of contemporary art – particularly one that was, lest we forget, an impression of something which no longer existed – could inspire such a polarised and universally zealous reaction, but as Whiteread explains, ‘people are always going to have strong opinions about something that hasn’t happened before’ and, unlike now, art ‘was not constantly in your face’. House had opened up a public discussion about contemporary art like nothing before it, and like Ghost it was unsurprisingly nominated for the Turner Prize. House was never intended as a permanent work – its physical manifestation of imposed absence demanded that it must disappear just as 193 Grove Road had before it. As its council-approved lifespan drew to a close, though, it seemed clear to Artangel that its importance merited a stay of execution. As Whiteread was accepting the 1993 Turner Prize at the Tate Gallery, James Lingwood was on the Underground, rushing from Bow to Millbank to deliver her the council’s verdict. As it transpired, the local authorities were not fans – House would stand for no longer than the grudging 80 days it had originally been granted. Despite the fact that House stood for barely three months, its impact on British art is still resonant 20 years on. 1991–93, according to Lingwood, heralded a ‘confluence of young artists’. 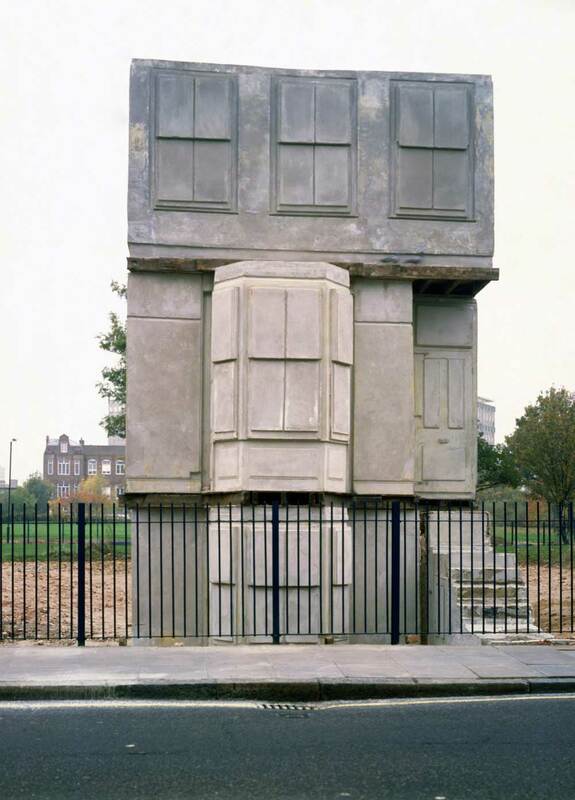 House, along with Damien Hirst’s The Impossibility of Death in the Mind of Someone Living, was among ‘the most important works of the era, the ones that crossed the threshold from a rather closed scene to an international phenomenon’. Didn’t Whiteread fear it might become something of an albatross? ‘I was always aware of that, but no. I’m very proud of House… and I don’t want to sound arrogant,’ – she doesn’t – ‘but it opened up a dialogue. It really did change contemporary art in the UK’.